I’m realizing that I have quite a few new visitors to my blog and maybe it’s a little difficult to get a handle on what’s going on with Drew, with over 100 posts. So, I thought I would sum it all up in a post in case you need some more context to our adventures in Florida! I have included links to related posts written about subjects/events I mention. Feel free to view them! Enjoy! First, Drew just turned five years old at the beginning of February. Our permanent residence is in Western Kentucky, though we’ve been temporarily living in West Palm Beach Florida since May 2012, more on that in a minute. Drew has TAR Syndrome. This is an extremely rare syndrome, only affecting 1 out of 250,000 people though I’ve been told that the severity in which Drew is affected makes him a 1 in a million. TAR is an acronym for Thrombocytapenia Absent Radaii. Don’t you just want to squish him! Thrombocytapenia is a blood disorder characterized by a low platelet count. Platelets are the cells that make your blood clot therefore with a lower count the longer it takes to stop bleeding. A normal range of platelets per millilitre of blood (I believe that’s how they measure it) ranges between 150,000 – 400,000. With a very low count of platelets, spontaneous bleeding can occur leading to tragic brain bleeds causing brain damage and death. Drew’s thrombocytapenia is very mild now though this characteristic of TAR is most critical for the first two years of life and gradually improves over time. Drew received a transfusion of platelets weekly for about two months of his life to maintain a level high enough to avoid risk. Anytime they went below 40,000, he would get a transfusion until after about two months he was able to produce enough platelets to hover around 50,000 – 60,000 and the weekly transfusions stopped. He required frequent platelet checks to monitor his levels and minor injuries were a great concern for him for a long time. Last year, his normal levels were 70,000 – 90,000. This year he’s had over 100,000 all by himself and even recently had the highest known platelets (without a transfusion) at 128,000. Drew has had additional transfusions in his 70,000 – 90,000 days in order to prep him for surgery, but with a count above 100,000 they typically don’t transfuse. So, our Thrombocytapenia days are pretty much behind us. Absent Radius means that he is missing the radius bone in each arm. The radius bone is the bone that connects the thumb to the elbow and is the defining characteristic of TAR (they must have a complete hand with all 5 fingers, including a thumb, to have TAR). 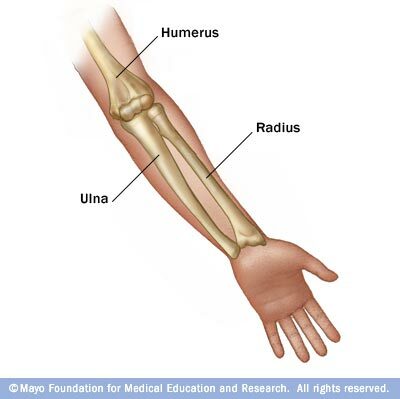 However, Drew has a more severe form as he is also missing the ulna in each forearm. His right arm has a shortened and curved humerus (the upper arm bone) and his left arm is arguably missing the humerus completely leaving him with an asymmetrical lack of arm length. You’d be surprised how little his shortened arms has affected his life. He can feed himself with utensils, open tops and manipulate toys, pick his nose, grasp objects from the floor, etc. He does struggle slightly with having enough hand strength to be able to mark with a pen or a pencil, but this is easily fixed with a marker as it requires a lighter touch. We’ve consulted with a few orthopedic doctors regarding his hands and right now he’s a little too young and they have felt he had enough capability with his hands that surgical intervention might hinder him at this point. Some people with TAR also have other issues. 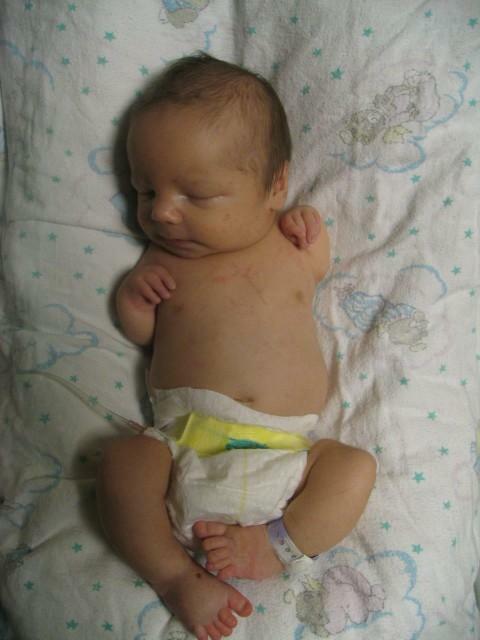 Some also have congenital heart defects which Drew was unlucky enough to be the recipient of. He had a hole in his heart, the aorta which is the main artery leading away from the heart was narrowed, and the valve in the aorta that prevents blood from reentering the heart leaks blood back into his heart leaving him with a significant heart murmur. 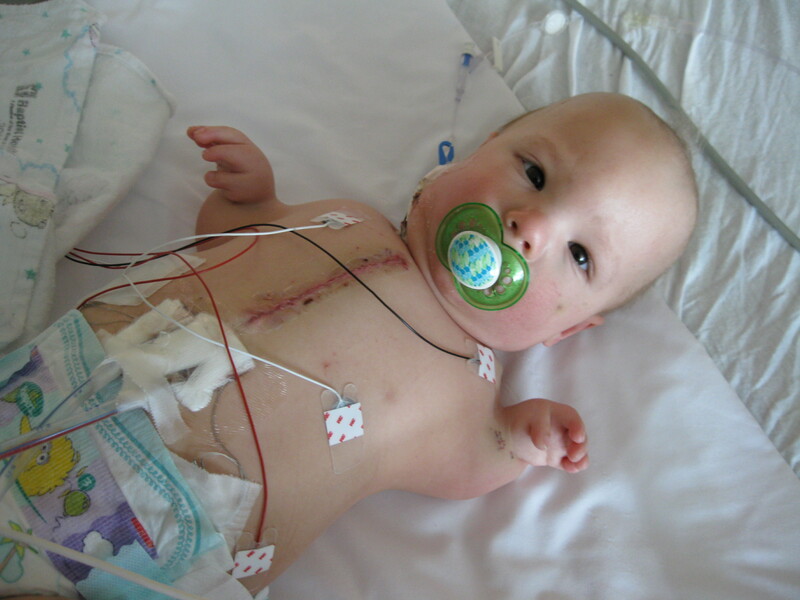 In January 2009, Drew had open heart surgery to repair these defects. They were unable to completely repair the valve so Drew is regularly seen by a cardiologist to monitor his heart. Drew takes daily medication to lighten the work his heart must do in order to prevent worsening the leakage. Recently, Drew’s valve has slowly worsened and we are potentially looking at another heart surgery including an artificial valve. Some people with TAR also have a milk allergy. Though Drew has had some gastro-intestinal issues, he never had the milk allergy. It was one thing he was spared. Now. Drew is currently undergoing surgical procedures to correct the rotation and provide leg extension in each leg. A world-renowned surgeon in West Palm Beach, Florida, Dr. Dror Paley, is working with Drew so he may one day walk. Starting in May 2012, Dr. Paley performed what’s called an osteotomy above the ankles which means Dr. Paley sawed through Drew’s lower leg bones in order to separate them in order to accommodate the correction and placed an external fixator placed on his right leg. The external fixator consisted of three rings which were tightly bolted to a dozen or more pins that were strategically placed into Drew’s leg bones and 12 struts which are expandable bars that connect each of the rings to each other. Each day, we made very small adjustments to the struts. A diagram of Drew’s fixator. Click the image for a larger view. Using a schedule provided by the surgical staff, we expanded or shortened the struts in very small increments daily which slowly turned and moved the rings, which are attached to the pins in his bones, in order to achieve a straight and corrected leg. The adjustment process takes about three months which is followed by an equivalent amount of time wearing the fixator with no adjustments to allow regrowth of bone and to heal. Then the fixator is removed. Each leg undergoes the same process, one at a time so I’m talking about six months per leg. During the entire period in which the fixator is on the leg (and for a long period of time even after it’s removed), physical therapy is necessary for muscle strength, regain range of motion, and to learn to walk, with and without the fixator. It’s a very painful process as who wants to stretch and bear weight on a leg with thick pins drilled through skin, muscle and bone? Currently, Drew’s right leg has been corrected, the fixator was removed in September 2012, and is currently wearing a brace to prevent the rotation and lack of extension from returning. He has an external fixator on his left leg and we are within 11 days of finishing the adjustments so his leg is almost perfect. January, he suffered a setback during physical therapy when a routine stretch fractured his right femur, the leg with the brace. He underwent immediate surgery to repair and was casted. He has since had the cast removed and we are awaiting another surgery to remove pins that were placed in his femur to heal the fracture. He was previously just beginning to learn to walk with the brace and his left fixator and the same day as the fracture had stood up on two straight(ish) legs unsupported maintaining his balance for the first time. It was tragic needless to say to take this large of a step backwards. Once his pins from the right leg are removed during surgery, we will return to Kentucky for a short period of time while we wait for his left leg to regrow bone where they were cut and we’ll return to Florida in the summer to remove the fixator and presumably be fit with a brace. You may wonder, why did we move from Kentucky to Florida for these procedures? For two reasons. First, we visited four orthopedic specialists in Nashville, TN; St. Louis, MO; Lexington, KY; and even Boston, MA on a hunt to find hope for Drew’s walking future. The doctors at Vanderbilt, Shriners and Boston Children’s Hospital couldn’t come to any conclusions about what to do, if anything, for Drew. Drew used his legs in their previous position about half of the time to compensate for his short arms. He would sometimes use them to transfer objects from one hand to another, sometimes use them to prop items so he had two free hands to manipulate the item, etc. and they were a little reluctant to remove that capability. While we appreciated for this theory and had the same concerns, we wanted to make sure that we did everything we could to have the confidence that things were the way they were meant to be. We heard of Dr. Paley from other people with TAR and Dr. Paley turns out to be the most experienced and the foremost leader in these types of deformities and surgical procedures in the United States. Dr. Paley is internationally known and celebrated for his ability to enhance children’s futures with reconstructive surgeries. So, that is where we are at this point. Life is extremely difficult for us, though I think we are handling the added stress well. Drew’s daddy, my husband, flies back and forth between Kentucky and Florida on a regular basis in order to keep working. He’s a steersman, training to be a pilot, for a barge company in Western Kentucky working 3-week shifts. I previously had a full-time career, but was laid off around Thanksgiving. We were very surprised to have found out that I am pregnant with a miracle baby (learn more at www.babyinthebalance.wordpress.com). We are anxious to get Drew up and walking and doing what we can to maintain our sanity during these trying times. I’m glad we are nearing the end (fixator-wise) of this adventure. But, there is plenty more to come so I hope y’all continue to visit my blog to keep up and offer your support and thoughts! Read about our fundraising activities, Drew Walking Tall, to help with our travel, medical and living expenses here. You can always visit my About page if you forget what TAR is. Here are some YouTube videos you may enjoy! I met you a couple of years ago when we were at a give-away for medical supplies in Owensboro. We had our little boy, Luke, with us who also has Tar syndrome. He and Drew are only about 3 months apart in age. Please contact us. I’m sure Luke would love to meet Drew. We are about an hour from Louisville. We’d love to have you over for a meal or something. Hi! Sorry I hadn’t replied earlier…haven’t been back to check my site in a bit. My email is janelinky@gmail.com and i’d love to meet!